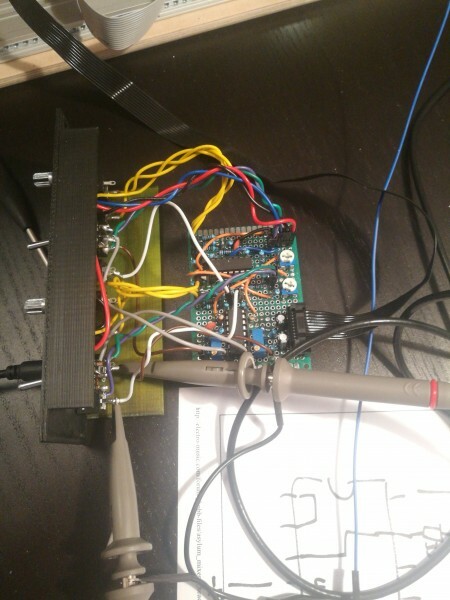 Hi, I'm debugging an MFOS dual VCA I've built on protoboard. It's really hard since I don't really know what to look for. I get surprised by some of the measurements but then again I've been surprised before with working circuits I don't fully understand. So, one of the channels is completely dead on output. I've been focusing on the other one that at least has output, and when I have fixed that one I can A/B check on measure points to pin-point what's wrong with the first. 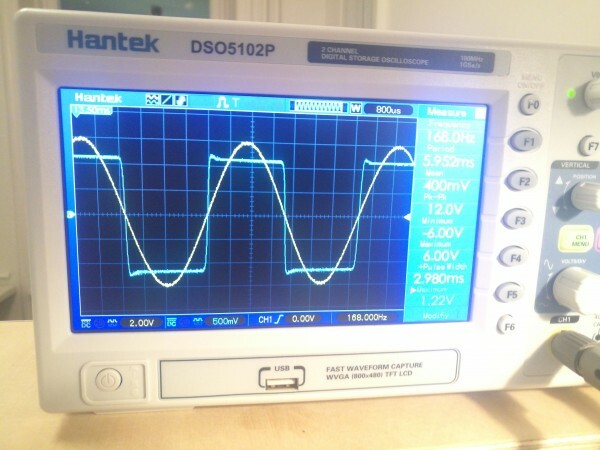 *channel 2 lin - attenuation works, but the audio signal is turned into a square wave. Any help on what to look for is highly appreciated. I've been poking around with my scope for hours, but simply have no clue. * after this is pushed against the negative rail, I have around -6 to -10V on the linear side of the switch. But only if floating, If I chose linear to connecto to the OTA pin 1, it's going down to -10.5 to -10V. I have a non-inverting input on pin 3 of the OTA which seem to do around 1.5V Pk-Pk. Is that too much? Oh, yes it was. Love how posting question gives you the solution sometimes. TRIMA was turn way to far which made the difference on the inputs too big -> disting towards square. Sometimes I hate those multi turn trims because I'm too lazy to test the full range. * Channel 2 Linear - WORKING!! After much pain and relentless debugging I got it working. Yey! I had done so many different errors when protoboarding this. I think my big lesson is to never ever protoboard anything this big on such a small board with so little planning. I mean, look at this mess. I started out with no plan at all and just started placing components. Hubris. I also burnt quite a few LM13700 - actually only one side of them and that was probably the reason why it took me so long to realise. 2) Not connected the 3904 base to the output of the first cv buffer. 3) mixed up channels when fallbacking to wires - the logA/linB on one side and logB/linA on the other for total confusion. 4) Wrong values for the 2K trimmers (was 20K). Not sure about that one, if I actually made that on purpose for now when trimming to have as little cv bleedtrhough as possible I actually hit ccw limit on them. Not sure yet if this is 2K or 0 ohms yet, but if 2K it would have been good with a higher value. As a year long stripboard builder and always using self built cases and suit cases i don't know if it would be maybe more easy to use stripboards and then maybe panel mounted knobs and jacks. Guess there are some people here, who have build proper DIY modules without etched boards and have more of their experiences to share. I considered using this kinds of boards to do quick but permanent prototypes after feeling I have something feasible on the breadboard. Thing was that I started out with so many different projects and I had about ten breadboards lying around and I started to loose memory of what each one even was. And they fall apart and stuff. 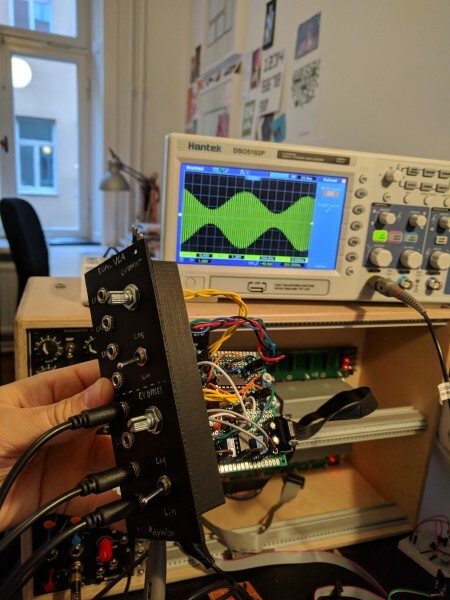 But these proto's haven't been that quick for me since I've made so many mistakes I think my main problem was just not planning (because that's boring) and wanting to make it really small because eurorack. I haven't tried stripboards for these projects, but I've used these breadboard looking protoboards. Felt nice since I could imitate a breadboard layout pretty much 1-1. But not really since there wasn't 5 connections on each side, but maybe 3+4 I think which made the whole 1-1 fall apart a bit. Stuff like that so I can have working stuff on a breadboard for a while and interfacing with my rack. Also considering toner transfer method. Felt it was going to be hard to align for double sided but just realized that if I just drill a few holes first, aligning against the holes would be super easy…? I have this circuit on a little PCB, and I think I have some left. PM me if you are interested, it may have SMT parts, but I can solder these for you if needed. checked, and yes I have plenty of boards left, and yes it does have the IC's in SMT, also, it is a dual, but only log, so not switchable between LOG/LIN. This is actually the first module I'm trying to build from a schematic. 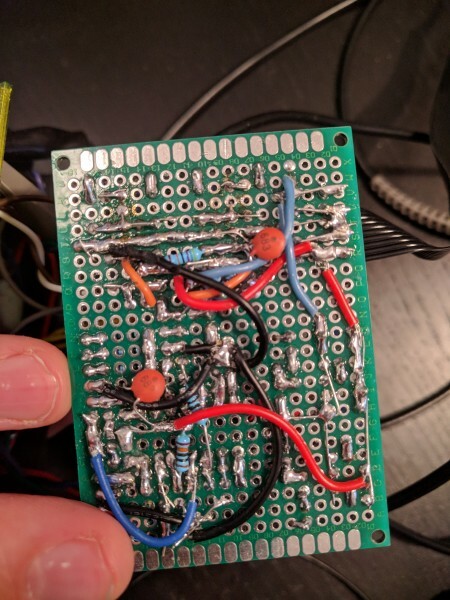 I've breadboarded the circuit for the second time and I'm pretty sure I've got all the components and connections right. However i have a problem with Rays instructions to adjusting the trimmers. I've set R10/R32 to 0V as he suggest as a first step. 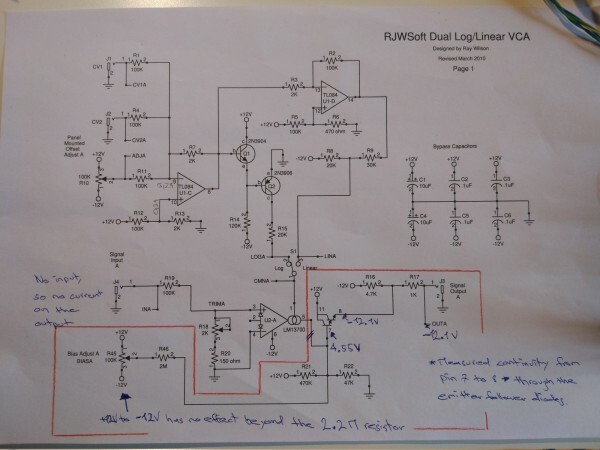 I can apply any voltage I want from -12V to +12V with the bias adjust, but I only get a constant -12V on the signal output. I have neither CV, signal in or signal out attached to the circuit. I didn't have a 2M resistor at hand for R46/48 so I substituted with a 2.2M resistor. I don't really get the part of the circuit after the output of the OTA. I guess it's purpose is to translate the VC current back to a voltage!? Would be very thankful if someone could hint me in the right direction. I would suspect a bad LM13700 right off the top of my head. Hm, ok. I'll try to check that out. Kind of difficult to tell if it's actually doing what it's supposed to. Thanks for your hints RF! 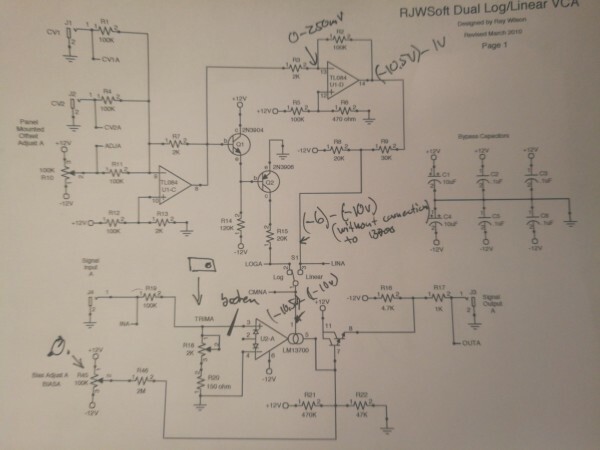 Could you maybe explain why you think the LM13700 is faulty? I'm not so shure about that.. Since the transistors are in a emitter follower configuration, the voltage on the emitter should be about the same as the base, right? I've measured all voltages on the circuitry on the output side of the LM13700. For some reason I have 4.55 on the base of the emitter follower and -12.1 on the emitter side. I could however measure continuity through the diodes. Is it okay to assume, that ohms law applies to that whole part of the marked circuit (you can neglect the emitter follower transistors)? Or do the transistors make the calculations more complicated? 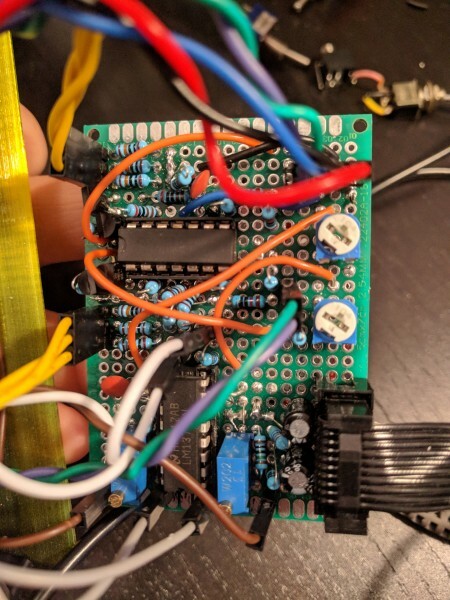 pretty sure of the wiring being correct - my first steps in troubleshooting are checking for wiring errors, soldering joints or solder bridges, polarity of components, correct values of components, orientation of IC's and then IC's themselves. I've had a couple of cases where I see rail voltages at outputs when IC's have been faulty - it's usually easy to substitute a socketed IC in the circuit before I start tracing voltages and trying to understand every part of the circuit. It looks like you are going at it in a very logical way - just a little different than what I start with. Good luck - you will find the problem if you keep at it. Did you get this working linwop?